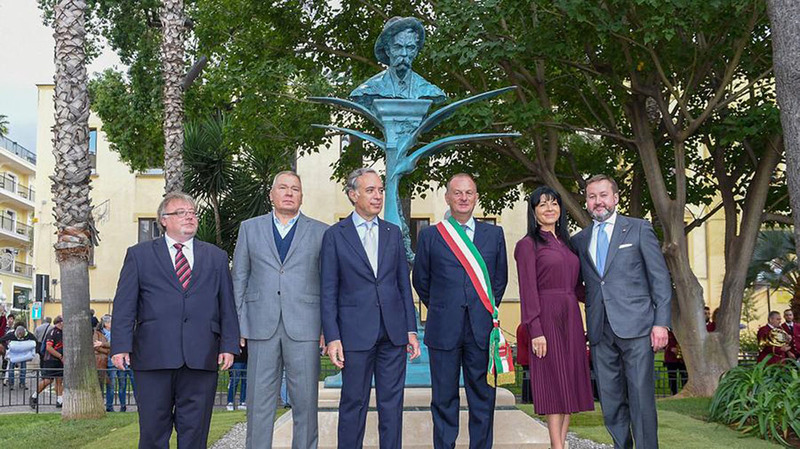 On October 27, 2018 in Sorrento (Italy) there was an unveiling ceremony for the monument to Maxim Gorky timed to the 150th birth anniversary of the writer (1868-1936). The author of the monument is the People’s Artist of the Russian Federation, Academician of the Russian Academy of Arts Alexander Rukavishnikov. The project has been organized by the City Hall of Sorrento in partnership with the House of National Literatures Foundation and A. Gorky Institute of World Literature under the auspices of the Italian Embassy in Moscow and Russian Seasons Project. The unveiling ceremony was attended by the Ambassador of Italy to Russia Pasquale Terracсiano, the Mayor of Sorrento Giuseppe Cuomo, Officer for International Relations of the City Hall of Sorrento Antonio Fiorentino, Chairman of the Board of Trustees of the House of National Literatures Foundation Timerbulat Karimov, Director of A. Gorky Institute of World Literature of the Russian Academy of Sciences Vadim Polonsky, Russian and Italian figures of culture. Alexey M. Gorky lived in Sorrento from 1924 till 1933, before the Sorrento period he had spent several years in the exile in Capri.